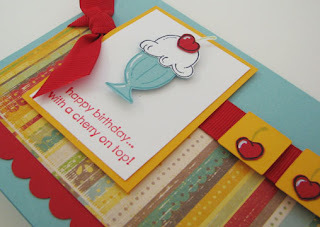 Patterned paper is K&Co and everything else is from Stampin' Up! The stamp set that I used is one of the level 3 hostess sets in the current catalog and it is becoming one of my favorites. Can we say YUMO!!! 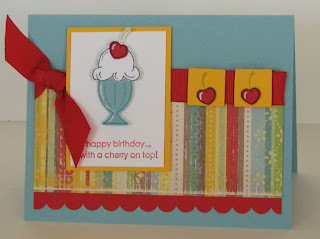 This was such a fun card and I love the cherry accents. I am really thinking sunday for dessert now. I can see why that stamp set would be one of your favorites... so cute.. I love it. Oh, what a cute, cheery card! This would make anyone smile!